Pactice identifying indefinite pronouns with this grammar activty. This grammar lesson includes 20 task cards and lists of singular, plural, and singular/ plural indefinite pronouns. This grammar activity asks students to find indefinite pronouns in sentences. Students may need practice identifying indefinite pronouns for several reasons. They may be first learning about indefinite pronouns, or working to tell the difference between them and other types of pronouns. Sometimes students need a refresher when they focus on subject and verb agreement. 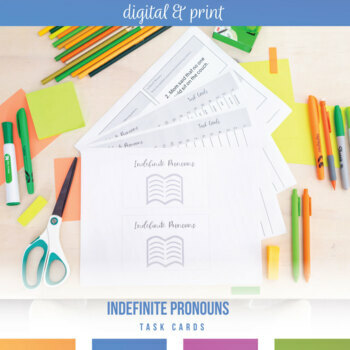 These task cards will help students when they need to spot an indefinite pronoun! → 20 sentences that each contain an indefinite pronoun. Many of the sentences contain other pronouns as well. 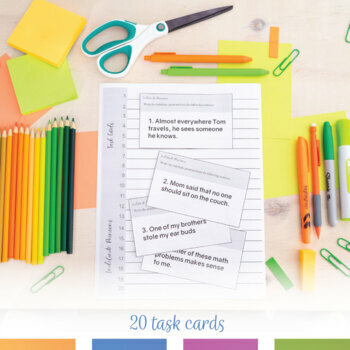 One sentence per task card. →The sentences are also in worksheet form which allows for differentiation. → 3 sheets that list singular, plural, and singular/ plural indefinite pronouns. This is a quick exercise to reinforce indefinite pronoun lessons!